Kemdent manufacture a range of Glass Ionomer cements to comply with ISO9917. 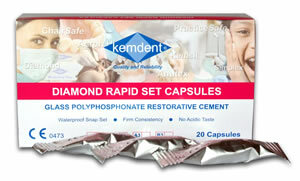 Diamond Carve Hand Mix, Diamond 90 Hand Mix and Diamond Rapid Set Capsules offer a real alternative to posterior composites and amalgam. Diamond Core, a core build up material, Diamond Snappy, a Glass Ionomer Cement used for children. Diamond Luting Cement Hand Mix and Diamond Luting Cement Capsules.